The animation below simulates images from a bronchoscopy. Animated cine images from virtual bronchoscopy. The animation begins with a view of the carina and advances distally into the right main bronchus. An obstruction of the right main bronchus is consistent with a bronchial tear. The radiograph below reveals injury to the right mainstem bronchus. Frontal chest radiograph from a 26-year-old man after major trauma. 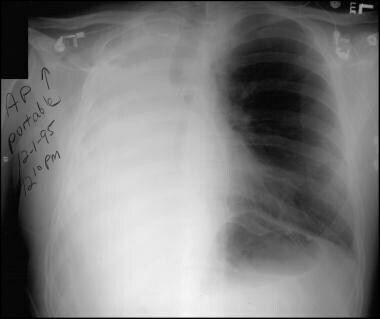 This image shows complete opacification of the right hemithorax without air bronchograms, abrupt termination of the right mainstem bronchus, and multiple upper right rib fractures. Other images below display tracheobronchial tears. 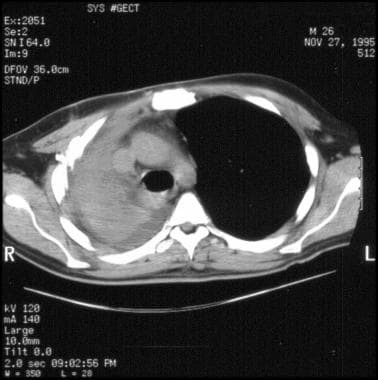 10-mm axial computed tomography (CT) scan of the chest with the lung window settings beginning at the level of the carina. This image demonstrates abrupt termination of the right main bronchus and complete opacification of the right hemithorax without air bronchograms. 10-mm axial computed tomography (CT) scan of the chest with the mediastinal window settings beginning at the level of the carina. This image shows multiple right rib fractures and a moderate-sized pleural effusion. There is mediastinal shift toward the side of injury. Fluid density is present in the right main bronchus, probably representing hemorrhage. Conventional radiography and CT scanning play important roles in the imaging of tracheobronchial tears. Although imaging findings can be highly suggestive in certain instances, radiography and CT scanning are often nonspecific for evaluating tracheobronchial tears. For patient education Information, see the Procedures Center, as well as Bronchoscopy. Radiographic findings of tracheobronchial tears (see the image below) reflect the location and extent of the injury or injuries. In 10% of affected patients, the tear is incomplete, with preservation of the peritracheal or peribronchial connective tissue sheath or sealing of the tear by fibrin. In these patients, the injury is not apparent on radiographs. In the most severely injured patients, the airway separates completely at the site of the injury with a visibly obvious distortion of the tracheobronchial anatomy. A pneumomediastinum, pneumothorax, or both are usually present in these extensive injuries. The location of the tear is important in determining whether a pneumomediastinum or pneumothorax develops. The most common site of tear is near the carina, because the airway is fixed and subject to shear injury. Tears within the mediastinal pleura cause a pneumomediastinum; tears beyond the mediastinal pleura cause a pneumothorax. Because the left main bronchus has a longer mediastinal course than the right main bronchus, injury to the left main bronchus is more likely to cause a pneumomediastinum, whereas injury to the right main bronchus is more likely to cause a pneumothorax. Note that in severe injuries, both a pneumomediastinum and a pneumothorax may be present. A pathognomonic indication of tracheobronchial tears, the fallen-lung sign, is visible in some patients with severe injury. In an uncomplicated pneumothorax, the bronchus remains fixed at the hilum, and the peripheral lung retracts from the parietal pleura toward the hilum. With complete laceration of the main bronchus, the bronchus may become partially or completely detached, allowing the lung to fall into a dependent lateral position and producing the fallen-lung sign. Other important radiographic findings that are associated with tracheobronchial tears include incorrect location or overdistention of the endotracheal tube (ETT) cuff and a persistent pneumothorax that is unrelieved by appropriate placement of a thoracostomy tube. [17, 18] A bayonet deformity or bronchial discontinuity may be present, and if the tear causes obstruction, peripheral consolidation or atelectasis without air bronchograms may be seen. In the typical traumatic transection of the cervical trachea, the infrahyoid muscle ruptures and the suprahyoid muscle retracts, raising the hyoid bone. Abnormal hyoid bone elevation suggests a cervical tracheal tear. The most specific signs of tracheobronchial tears are of an appropriately placed ETT that clearly extends beyond the expected tracheal lumen and a classic fallen-lung sign. [17, 18] Other signs are less conclusive and usually require bronchoscopic confirmation. Tracheobronchial tears may not be visible if the tracheal mucosa remains intact or is sealed by fibrin. Subtle airway discontinuity or irregularity and small focal peritracheal or peribronchial gas collections are observed much better on CT scans. Active bleeding from the lacerated airway can occasionally be identified on enhanced CT scan images. 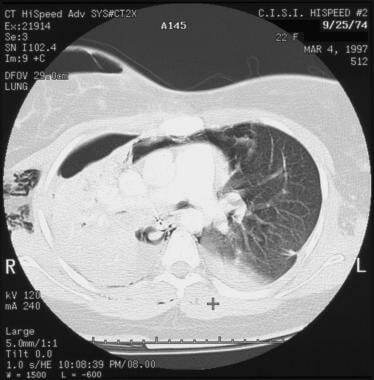 5-mm axial computed tomography (CT) scan image with the lung window settings beginning at the level of the carina. This image and the 4 CT scans immediately below again demonstrate abrupt termination of the right main bronchus, complete opacification of the right hemithorax with few air bronchograms, subcutaneous emphysema, a moderate-sized anterior pneumothorax, and a pneumomediastinum. Note that the azygos vein is outlined by mediastinal gas. The superior segment of the left lower lobe is atelectatic. 5-mm axial computed tomography (CT) scan images with the lung window settings beginning at the level of the carina. This image demonstrates abrupt termination of the right main bronchus, complete opacification of the right hemithorax with few air bronchograms, subcutaneous emphysema, a moderate-sized anterior pneumothorax, and a pneumomediastinum. Note that the azygos vein is outlined by mediastinal gas. The superior segment of the left lower lobe is atelectatic. 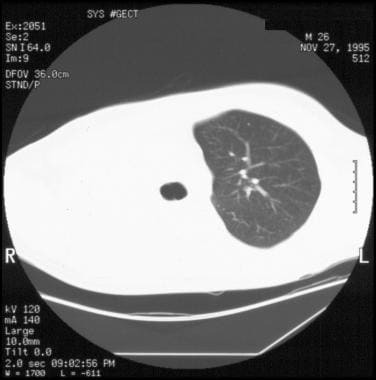 5-mm axial computed tomography (CT) scan with the lung window settings beginning at the level of the carina. This image demonstrates abrupt termination of the right main bronchus, complete opacification of the right hemithorax with few air bronchograms, subcutaneous emphysema, a moderate-sized anterior pneumothorax, and a pneumomediastinum. Note that the azygos vein is outlined by mediastinal gas. The superior segment of the left lower lobe is atelectatic. In some instances, definitive evidence of a tracheobronchial tear is depicted on CT scans. If the diagnosis remains in doubt, reformatted images along the luminal axis of the airway or virtual endoscopy may be helpful. The high-quality images that are obtainable with multidetector CT scanners allow excellent virtual endoscopic reconstructions. [19, 20] In other instances, the findings are inconclusive and should be interpreted in the proper clinical context. CT scanning can be falsely negative, particularly in relatively minor injuries, and bronchoscopy should be performed in patients with a strong clinical suggestion of a tracheobronchial tear. MRI shows findings similar to those seen on CT scanning. The primary strengths of MRI are a multiplanar display and high tissue contrast. However, these strengths are offset by the relative difficulty in preparing the patient for MRI, the fact that monitoring trauma patients is more difficult during the imaging examination, and the lower availability of MRI. As with CT scanning, the more common findings of tracheobronchial tears in MRI are variable, nonspecific, and only suggestive. MRI occasionally may be useful in depicting the location and extent of injury in this condition. As with conventional radiography and CT scanning, MRI can be falsely negative, particularly in relatively minor injuries and in patients with a strong clinical suggestion of a tracheobronchial tear. Patients with tracheobronchial tears have diverse presentations on ventilation-perfusion (V/Q) scans, depending on the severity of the injury. In minor injuries in which there is intact blood flow and no airway obstruction or pneumothorax, a tracheobronchial tear is not detectable. If the tracheobronchial trauma causes partial or complete airway obstruction without an associated vascular injury, normal physiologic response diminishes perfusion to the region of impaired ventilation, yielding a V/Q mismatch. In the most severe injuries, in which there is disruption of airflow and perfusion, a matched defect is visible. Although these physiologic responses are identifiable on V/Q imaging, CT scanning and bronchoscopy are more specific in the diagnosis of tracheobronchial tears. The degree of confidence is low with nuclear imaging. As with other imaging studies, false-negative examinations can occur in cases in which there are minor injuries. Angiography is not a primary procedure for evaluating patients who have tracheobronchial trauma; however, angiography is often used to assess any associated thoracic trauma. If active bleeding is present at the tracheobronchial tear, it can be visible on aortography or pulmonary angiography. The degree of confidence is low with angiography. Angiography does not demonstrate a tracheobronchial tear if the tear is not actively bleeding. Kirkham JR, Blackmore CC. Screening for aortic injury with chest radiography and clinical factors. Emerg Radiol. 2007 Sep. 14(4):211-7. [Medline]. Faure A, Floccard B, Pilleul F, et al. Multiplanar reconstruction: a new method for the diagnosis of tracheobronchial rupture?. Intensive Care Med. 2007 Aug 8. epub ahead of print. [Medline]. Armstrong P, Wilson AG, Dee P, Hansell DM, eds. Tracheal or bronchial rupture. Imaging of Diseases of the Chest. 3rd ed. St Louis, Mo: Mosby-Year Book; 2000. 958-60, 977-81. Collins J, Primack SL. CT of nonpenetrating chest trauma. Appl Radiol. 2001. 30(2):11-21. Huson H, Sais GJ, Amendola MA. Diagnosis of bronchial rupture with MR imaging. J Magn Reson Imaging. 1993 Nov-Dec. 3(6):919-20. [Medline]. Kuhlman JE, Pozniak MA, Collins J, Knisely BL. Radiographic and CT findings of blunt chest trauma: aortic injuries and looking beyond them. Radiographics. 1998 Sep-Oct. 18(5):1085-106; discussion 1107-8; quiz 1. [Medline]. [Full Text]. Moriwaki Y, Sugiyama M, Fujita S, et al. Application of ultrasonography for blunt laryngo-cervical-tracheal injury. J Trauma. 2006 Nov. 61(5):1156-61. [Medline]. Scaglione M, Romano S, Pinto A, et al. Acute tracheobronchial injuries: impact of imaging on diagnosis and management implications. Eur J Radiol. 2006 Sep. 59(3):336-43. [Medline]. Sersar SI, Rizk WH, Bilal M, et al. Inhaled foreign bodies: presentation, management and value of history and plain chest radiography in delayed presentation. Otolaryngol Head Neck Surg. 2006 Jan. 134(1):92-9. [Medline]. Tocino I, Miller MH. Computed tomography in blunt chest trauma. J Thorac Imaging. 1987 Jul. 2(3):45-59. [Medline]. Van Hise ML, Primack SL, Israel RS, Muller NL. 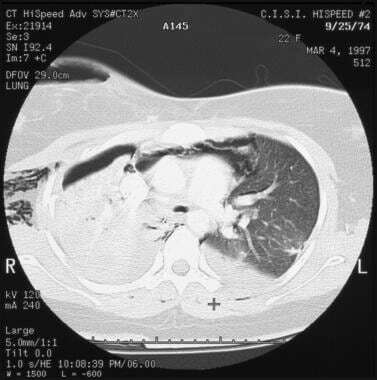 CT in blunt chest trauma: indications and limitations. Radiographics. 1998 Sep-Oct. 18(5):1071-84. [Medline]. [Full Text]. Weir IH, Muller NL, Connell DG. CT diagnosis of bronchial rupture. J Comput Assist Tomogr. 1988 Nov-Dec. 12(6):1035-6. [Medline]. Hwang JJ, Kim YJ, Cho HM, Lee TY. Traumatic tracheobronchial injury: delayed diagnosis and treatment outcome. Korean J Thorac Cardiovasc Surg. 2013 Jun. 46(3):197-201. [Medline]. [Full Text]. Dertsiz L, Arici G, Arslan G, Demircan A. Acute tracheobronchial injuries: early and late term outcomes. Ulus Travma Acil Cerrahi Derg. 2007 Apr. 13(2):128-34. [Medline]. Zhao Z, Zhang T, Yin X, Zhao J, Li X, Zhou Y. Update on the diagnosis and treatment of tracheal and bronchial injury. J Thorac Dis. 2017 Jan. 9 (1):E50-E56. [Medline]. [Full Text]. Tack D, Defrance P, Delcour C, Gevenois PA. The CT fallen-lung sign. Eur Radiol. 2000. 10(5):719-21. [Medline]. Unger JM, Schuchmann GG, Grossman JE, Pellett JR. Tears of the trachea and main bronchi caused by blunt trauma: radiologic findings. AJR Am J Roentgenol. 1989 Dec. 153(6):1175-80. [Medline]. [Full Text]. Sangster GP, González-Beicos A, Carbo AI, et al. Blunt traumatic injuries of the lung parenchyma, pleura, thoracic wall, and intrathoracic airways: multidetector computer tomography imaging findings. Emerg Radiol. 2007 Jul 11. epub ahead of print. [Medline]. Wang HC, How CH, Lin HF, Lee JM. Traumatic left main bronchial rupture: delayed but successful outcome of robotic-assisted reconstruction. Respirol Case Rep. 2018 Jan. 6 (1):e00278. [Medline]. [Full Text]. Magnotti LJ, Weinberg JA, Schroeppel TJ, et al. Initial chest CT obviates the need for repeat chest radiograph after penetrating thoracic trauma. Am Surg. 2007 Jun. 73(6):569-72; discussion 572-3. [Medline]. Parekh A, Graham R, Redman S. Ventilation/perfusion single-photon emission computed tomography: a service evaluation. Nucl Med Commun. 2017 Aug. 38 (8):672-675. [Medline]. [Full Text]. Paraschiv M. Iatrogenic tracheobronchial rupture. J Med Life. 2014 Sep 15. 7 (3):343-8. [Medline]. Dominguez E, De La Torre C, Sánchez AV, Hernandez F, Ortiz R, Moreno AM, et al. Severe tracheobronchial injuries: our experience. Eur J Pediatr Surg. 2015 Feb. 25 (1):71-6. [Medline]. Cine image from virtual bronchoscopy. 5-mm axial computed tomography (CT) scan with the mediastinal window settings beginning at the level of the carina. This image shows loculated right pleural effusion, longitudinal sternal fracture, and right rib fractures.